Despite the prediction of rain, which usually occurs during the months of July and August, God blessed the 5-day pastoral visit of Pope Francis to Korea with good weather. 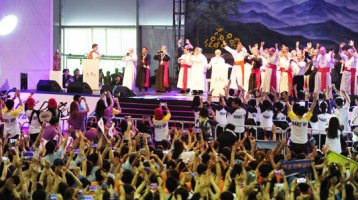 Hundreds of thousands people were able to attend the celebration of the Beatification of 124 Korean Martyrs in the heart of Seoul, Gwanghwamum streets on Saturday morning, August 16 followed by a visit to Kkottongnae, the largest Catholic Center for the poor and abandoned. A meeting of His Holiness with the religious and consecrated people in Korea was held there. In his speech at Kkottongnae with religious, Pope Francis said, "In the consecrated life, poverty is both a "wall" and a "mother". It is a "wall" because it protects the consecrated life, a "mother" because it helps it to grow and guides it along the right path. The hypocrisy of those consecrated men and women who profess vows of poverty, yet live like the rich, wounds the souls of the faithful and harms the Church." Missionary Benedictine Sisters involved in Pastoral and Youth ministries were also very busy and excited to organize and receive the Pope. While Sisters of Daegu Priory House applied for the meeting with Pope in Kkottongnae which required 2 full buses, Sisters involved with Youth Pastoral Ministries worked together with priests of Daegu Archdiocese and Daejeon Diocese for the 6th Asian Youth Day held on Sunday, August 17 at Haemi Sanctuary in Seosan, 151 kilometers south of Seoul - where about 1,000 Korean Christians were executed for their faith from 1866 to 1882. Among 6,000 youths was a group of 20 Austrian youth from Salburg Archdiocese who lodged at the Benedict Spirituality Center on Saturday, August 16. On the following day, they participated in the Morning Prayer at Priory House, met Sr. Bertwina Caesar at Parlor and had a delicious western style breakfast. 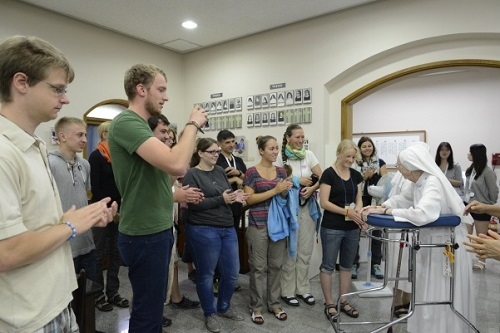 In fact, Daegu and Salburg Archdioceses have held ties for 50 years. 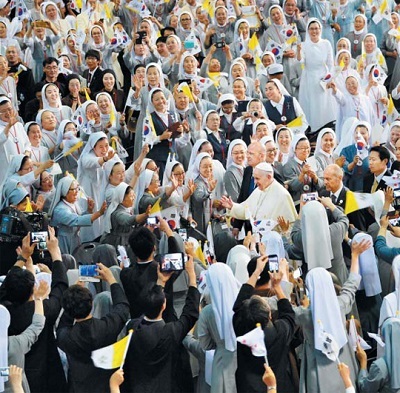 This first visit of Pope Francis to Korea marked a very deep impression not only on the minds of the Catholics, but also on the whole country. His way of reaching the poorest in society should be the way for everyone.